Over the last few years I've been involved in some meaningful Christian-Muslim dialogue. And out of those conversations I have published two well-received books - one was on the 'Bismillah', in the Qur'an, celebrating the grace of God and the other was on 'Isa', reflecting on the grace of God celebrated in the life of Jesus according to the views common to the Qur'an and the Gospels. Given continued distressing references to 'jihad' in newspaper, radio and tv headlines some of my friends, both Christian and Muslim, suggested I write a book about Jesus and 'jihad' and call it 'The Jihad of Jesus'. 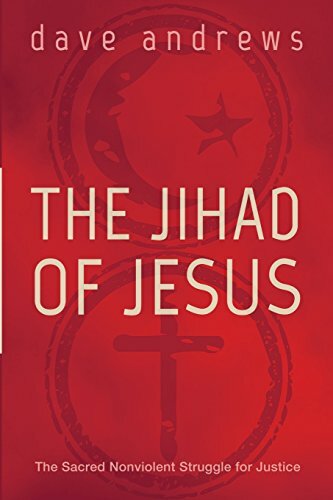 It was hoped the provocative title would get a lot of attention, and we could introduce Christians and Muslims to a Qur'anic reconstruction of the concept of 'jihad' in the light of the radical practical nonviolence of Jesus. I have not written this book as an expert. I am not. I have not written this book as a specialist. I am not. I have simply written this book in conversation with Muslim friends, seeking to find a way we can struggle for love and justice that is true to the best in our faith traditions. “Then they have a conversation about the Messiah and I think it’s very intriguing that he actually, in the context of that conversation, affirms the importance of the Messiah in a way that she can relate to and can embrace, yet he doesn’t expect her to change her religion from Samaritan to Jew. In my engagement with my Muslim friends, I want to affirm who Jesus is as the Messiah or Masih – something that’s acknowledged by both the Quran and the Gospels. But I do not believe I am being called to convert Muslims to Christianity. I believe I am called as a follower of Jesus simply to witness to Jesus in what I say and do with my Muslim friends”. Dave Andrews has set himself a formidable task: to build understanding and trust between Muslims and Christians when anti-Islamist sentiment is running high. But if the job is getting him down, it doesn't show as he bowls into the Mado cafe in Auburn, a stone's throw from the Gallipoli Mosque, Sydney's biggest Islamic place of worship. Andrews, who has been a community worker for more than 40 years, looks the part with his long white hair, unruly beard and Mahatma Gandhi-style glasses. As we pick at a dipping plate of hummus, jajic, beetroot and yoghurt with Turkish bread, Andrews describes how a long involvement with marginalised people in Brisbane led to his work as an interfaith bridge builder. The terrorist attacks on New York and Washington in September 2001 were a key moment. "The religious identity of the marginalised people we worked with was never an issue until 9/11," he says. "Then all of a sudden these refugees we had related to as Hazara or Afghans, or whatever, became Muslims and we became Christians. We were confronted with how to bridge this chasm in this new game of identity politics." Andrews knew he had to engage with this new, religious dimension to his life's work. In the days and months following 9/11 he spent time in mosques in Brisbane listening to the worshippers and praying with them. "I needed to look for Muslim counterparts who I could work with to rebuild some of the bridges that were being blown up. Not only by the terrorists, but by the reports of these events that terrified everyone including me." Andrews then began organising meetings involving people from many faith traditions – Christians, Muslims, Buddhists, Jews, Hindus and those with no religious affiliation. The aim was to "get together, to listen to one another and to learn from one another". Andrews is a devout Christian but has chosen to remain at the fringes of the organised church. In 1999 he published a book called Christi-Anarchy: Discovering a Radical Spirituality of Compassion. It asks how the history of the Christian religion could be littered with every kind of evil when Jesus Christ preached a gospel of love and peace with justice. He advocates a radical, subversive spirituality of compassion. Andrews has sometimes clashed publicly with church leaders including the former Anglican archbishop of Brisbane, Peter Hollingworth. Life as an interfaith bridge builder in Australia can be tough. Andrews tells the story of when he and his friend Nora Amath, a Muslim scholar, were invited to a Sunshine Coast church to speak about how Muslims and Christians could live in harmony. They were met by a group of angry protesters outside the venue. "There were hundreds of people there waving banners with words like 'Resist Islam', and the police were there to deal with the conflict," Andrews says. "It was terrible to see the way so many Christians express such hate for Muslims in their name of their faith. They were so blinded by their ideology." Andrews' animated face darkens and his voice quivers as he recounts this experience. "By far the most animosity I face is from Christians," he says. One outcome from Andrews' experience trying to build religious and cultural understanding is a provocative new book titled The Jihad of Jesus. In it he draws on the teachings of Muslim scholars to recast jihad as a "sacred non-violent struggle for justice" rather than violent holy war. 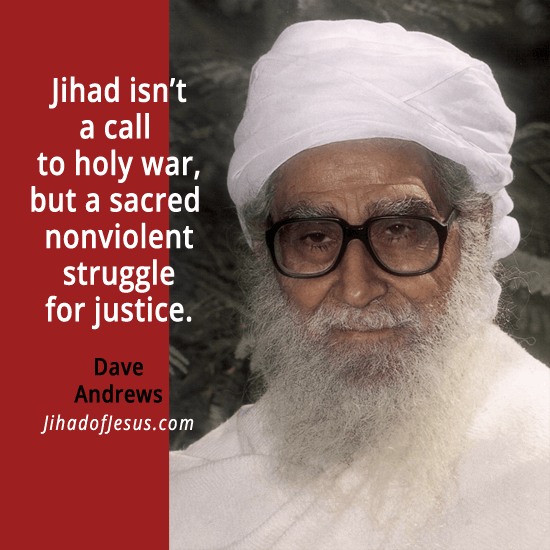 Andrews argues that the "strong-but-gentle" figure of Christ provides the ideal model for non-violent jihad. 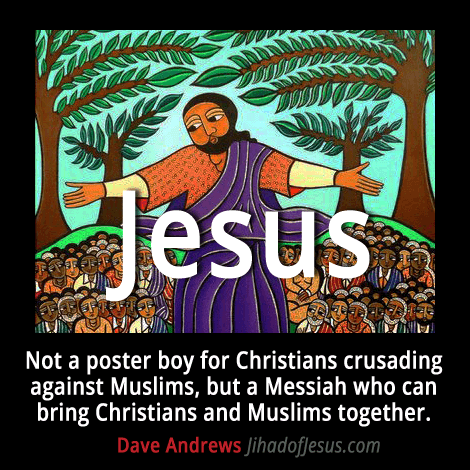 "Jesus should not be seen as a poster boy for Christian's crusading against Muslims but as a messiah who brings Christians and Muslims together for a non-violent struggle for justice," he says. As a plate of steaming shish kebabs arrives at our table, Andrews tells me with a smile about the reaction of one Muslim friend after she read a draft manuscript of The Jihad of Jesus: "Dave, you're going to get shot." Andrews' struggle for interfaith harmony builds on an extraordinary life of community work. In a "fit of romantic, unrealistic idealism", he and wife Ange sold their house in Brisbane in the early 1970s, gave the money away and moved to Afghanistan to work with young people, especially travellers. The pair lived through the 1973 coup in Kabul before moving to India where they spent a decade doing community work with drug addicts, slum dwellers and others. Their first daughter, Evonne, was born while they were living in India and they adopted a second daughter, Navi, a Nepali orphan. Andrews was caught up in the deadly anti-Sikh riots that engulfed New Delhi in 1984 after Indian prime minister Indira Gandhi was assassinated by her Sikh bodyguards. Amid the mass slaughter, he stood in the doorway of his Sikh neighbour's house and turned away a Hindu lynch mob. Andrews and his family eventually returned to Brisbane where he founded the "Waiters Union", a community network serving marginalised people especially the disabled, refugees and Aborigines. Andrews has also worked as an educator for the overseas aid agency TEAR Australia for nearly 30 years. It was this involvement that eventually led him to try to build bridges between Muslims and non-Muslims. "I never thought I'd find myself engaged in this Christian-Muslim dialogue because I didn't relate to Muslims as Muslims, I'd relate to them as friends," he says. "But after 9/11, identity politics came to define them as Muslims and the whole challenge became how do we overcome this chasm of suspicion and reach out to each other." Andrews says it's a major problem that most Australians don't have any meaningful contact with Muslims because they make up only a little more than 2 per cent of the population. "All they are going to do is derive their understanding of Muslims from the media which does not accurately represent them," he says. "So it's almost inevitable that people have very twisted and biased views." Andrews has found the best way to overcome the misunderstandings and prejudice is for Muslims and non-Muslims to meet face to face. "It's only in that interaction that people have the opportunity to have their stereotypes challenged in the face or the humanity of the other," he says. "We've seen many people change their negative attitude toward Muslims when they have had a face-to-face encounter," he says. "Although there are always some who still hold onto their stereotypes tightly." As Turkish coffee arrives at our table, I ask Andrews if he's hopeful that greater religious harmony can be achieved. "People sometimes say to me, 'This is a great dream, Dave, but it's an impossible dream'," he says. "I've got to admit it's really difficult but I won't concede it's impossible. I won't call it the impossible dream, I'll call it the improbable dream. The odds are against us but I still think it's possible. If we have leaders in our community that are genuinely committed to creating a culture of dignity and respect, affirming all people and helping people come together to deal with their problems I think it is possible." 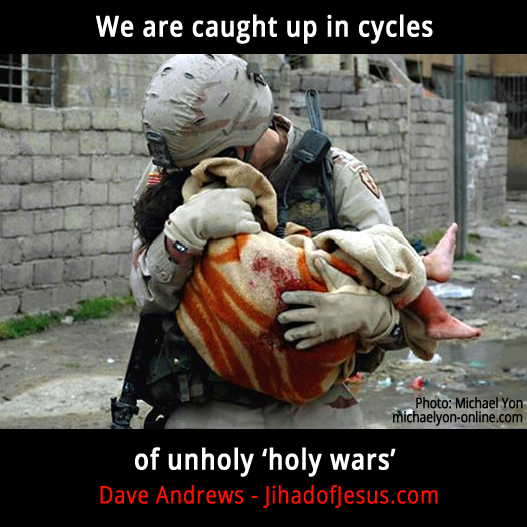 Andrews reels off a list of examples where groups involved in religious conflict have found ways to build peace. "In some places in the world Christians and Muslims have come together in the midst of violence, in the midst of civil war, in the midst of slaughter to support each other and find ways forward," he says. Andrews was heartened by the "I'll ride with you" campaign, the social media movement showing solidarity with Muslims following December's Martin Place siege. "It was something simple, something practical and a bit of a game changer," he says. "It can happen here when you least expect it." 2015 trains Christians and Muslims in non-violent Jihad and publishes The Jihad of Jesus. The sacred non-violent struggle for justice. The spread of Islamic militarism and the threat posed by Islamic State in the Middle East sparks an endless and circular debate. Muslims need to acknowledge and loudly condemn the violence being waged in the name of Islam, say Western political leaders, notably Tony Abbott. Islam is a peaceful religion and Islamic State has nothing to do with us, comes the indignant reply from Muslims, who grow ever more weary at being expected to condemn the terrorism they abhor. It is a polarised conversation that ultimately goes nowhere. To probe deeper — to question the construction of religion and to analyse faith, today and through the ages — is akin to walking through a field of landmines. Brisbane-based author Dave Andrews is ready for the challenge. The devout Christian has just published a book, provocatively titled The Jihad of Jesus, which asks Muslims and Christians to examine their religion in practice, and to acknowledge the violence that lies at the heart of the construction of religion throughout history. The atrocities committed in the name of religion are undeniable. They stretch from the Christian holy wars that began towards the end of the Roman Empire, and continue through history right up to the present-day threat of Islamic extremism. But there is a process of minimisation at play that must be acknowledged, Andrews argues. It’s an almost unconscious discounting, or a shifting of emphasis, that seeks to justify or underplay the violence that has been waged during holy wars for centuries. “This brings us face to face with the life and death question, at the very heart of the matter, that we desperately need to answer,” Andrews says in his book, launched this week. “Are the atrocities that are done in the name of Christianity or Islam true indicators of the nature of Christianity or Islam, or not? It is a macabre balance sheet, but it’s all part of a process of introspection that Andrews says is critical if there is to be a lasting peace, in which Christians and Muslims can join together in a non-violent struggle for justice. The author’s determination to broker peace began at home in the suburbs of Brisbane in the wake of the September 11 terrorist attacks in the US in 2001. Andrews had lived for many years in Afghanistan during the 1970s and 80s and on his return to Australia he undertook voluntary work helping to settle Afghan refugees here. He had a large number of Muslim friends. Andrews was appalled by the scale of the 9/11 atrocity but was also deeply disturbed by the political response that culminated in the invasion of Iraq. When Andrews first sought out Nora Amath, a Muslim woman active in the organisation Australian Muslim Advocates for the Rights of All Humanity, the graduate of a sociology doctorate was burned out. She assumed that like so many other devout Christians who used interfaith dialogue as a smokescreen to recruit Muslims to their own cause, Andrews was just another evangelist Christian. “From about 2002 until about 2007 I was doing, I guess, what you’d almost call a one-woman campaign to go out there, meet people and confront prejudice,” Amath says. “I just decided I’m going to put myself out there and answer any questions. But by 2007 I was pretty jarred by the whole experience. There were some wonderful moments of understanding and openness and grace from people, but at the same time there were quite a lot of incidents of bigotry that I just couldn’t break down. I said, ‘I can’t keep doing this.’ It was just really taking a toll on me. So Amath initially rebuffed Andrews, who was keen to develop relationships with Muslims as part of his quest to establish a common ethic among religious traditions that could be used to counter violence waged in the name of God, or Allah. Andrews’s thesis is built on a concept of jihad that can be embraced by Muslims and Christians, jointly committed to a “radical, practical, non-violent struggle” to defeat extremism. “At the moment jihad is a byword for terror,” Andrews says. “So when people think of jihad they think of atrocities. “But if you go back to the Koran, the word jihad is not the word for war. The word for war in the Koran is qital. The word jihad actually means struggle. 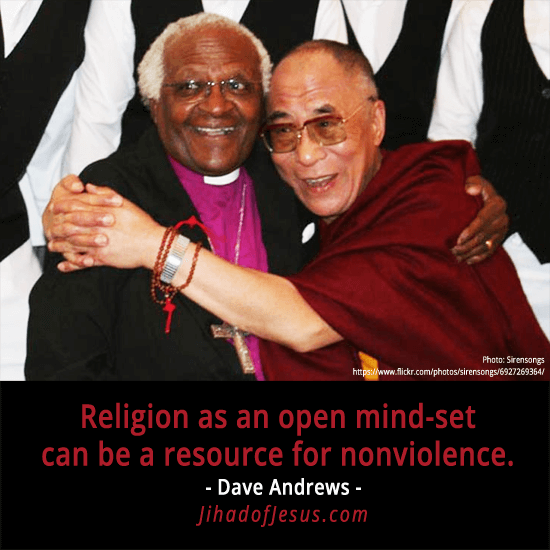 The overwhelming emphasis of the word jihad in the Koran is non-violence. If you take that as a Koranic framework for jihad it just shows that everything that most of these jihadists are involved with is totally unacceptable in Koranic terms. But achieving common ground it is not as simple as condemning violence, Andrews says. It involves a critical reflection of the way religions have been constructed. In 1978, a professor of anthropology based at Fuller Theological Seminary in California, Paul Hiebert, raised the alarm at the dangerous implications of what he defined as “bounded set” religion in an essay, Conversion, Culture and Cognitive Categories . Fixed ideas of orthodoxy or behaviour define religion via boundaries that theologian Robert Brinsmead has said draw “lines of demarcation through the human race”. 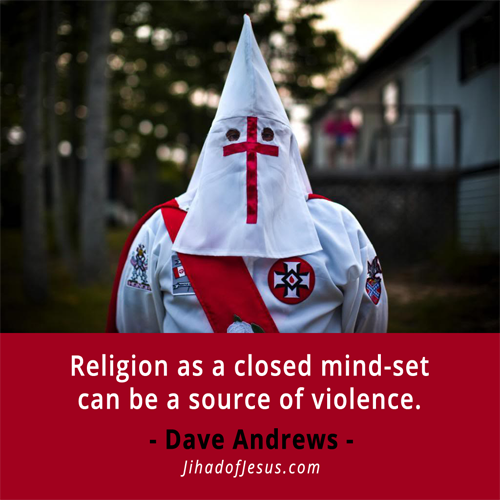 “I think in order to understand the violence of religion we have to understand that it’s a way of defining religion as a closed set, where you’ve got people who are in the right, people who are in the wrong,” Andrews says. “Therefore the people who believe they are right feel they have the responsibility to impose their views on others non-violently, or if necessary, violently. There is much common ground in the Abrahamic faiths, Amath says. “I remember I was at a speaking engagement with Dave and somebody asked me about Jesus, and if I believed in Jesus,” she says. “I said emphatically yes, of course, as Muslims we have to believe in Jesus. He is one of the revered prophets, and in fact he is mentioned more times in the Koran than Mohamed is mentioned. And so he does play a pivotal role in the basis of Islam. “And so as Muslims, it’s obligatory for us to believe in him, to believe in his life. We have the same understanding of the immaculate conception of Jesus from the Lady Mary, and in fact the Lady Mary has a passage devoted to her. And so these are two very revered figures in Islamic history. And so of course Muslims need to believe in Jesus, that’s part of their creed. “However, I would say probably in the past three years, through my conversations with Dave, I realised I really didn’t know enough about Jesus. Andrews and Amath are hopeful that conversations across faiths can unfold throughout the community in the same way their own friendship has evolved. But the challenge of navigating such terrain is difficult amid a highly charged political environment. Extended bilingual interview by Helle van der Wijst, of Ikon, a Dutch TV production company, with Dave Andrews about The Jihad of Jesus, radical compassion and interfaith peacemaking that took place on top of a skyscraper over looking the city of Utrecht a the beginning of the New Day (De Nieuwe Dag).